For almost 50 years, the physicians at Medical Center Eye Clinic have been providing state-of-the art ophthalmic care to our Salem community. We strive to create a family-like environment that leaves patients feeling comfortable and confident in the level of care they receive. What sets our physicians apart from others in Salem, Oregon is that our ophthalmologists take the time to answer questions patients have about any of the testing or procedures we provide. 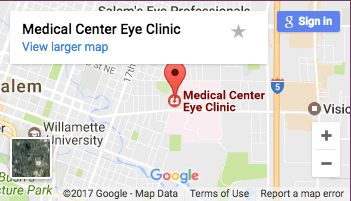 We emphasize patient care and a personal touch, from the cataract surgery Salem has to offer to medical screenings or our onsite Optical Dispensary. Our doctors spend a significant amount of time with every patient, and we make it a point to schedule appointments that provide patients with the time they need to fully communicate their questions or concerns with our staff. You'll never feel rushed or pushed out the door at Medical Center Eye Clinic. Refractive Correction Services - Optical Dispensary On-Site!